Prom Dress Codes have taken a sinister turn to oppression and threats to ban or remove students from the big event. In an effort to avoid Prom night enforcement, when the student is turned away, schools have started an approval or preapproval process. Typical Prom Outfit Dress Code is: Dresses cannot be too short, too low-cut, expose too much skin around the midriff or be inappropriately revealing. And many schools are adding that student must wear the “correct” gender-specific formal wear. Anyone else notice this seems to be directly limiting the females choice? I guess I should ask, if anyone on the school board noticed, since it is their rules. Here is a great photo article of Banned Prom Dresses. Dress codes that state anything cannot be “too much” or “too anything” is subjective. Students and parents alike are left to buy a dress (usually spending hundreds of dollars) and hope the female student is not turned away at the door, ruining Prom. Some schools have implemented a preapproval process to reduce Prom dress code violations. Dresses can be preapproved by submitting a photo – This allows the student to submit a photo of her dress of choice before purchasing the dress. Notice is provided ahead of Prom for dresses that are not approved. This will allow for minor alterations, or selection and submission of a new outfit. Preapproval removes the Prom night fear of being turned away, or asked to leave in the middle of Prom. Consistent rules applied to all of the submitted outfits (in theory). Clearly written, specific dress code rules (skirt hem no more than 4 inches above the knee, for example) are easily verified and enforced. There would be no need for preapproval, does the outfit meet specific regulation or not? Preapproval only enforces the subjective nature of dress codes. Unless the photo is submitted with a ruler against the leg, how would a dress or skirt hem be deemed acceptable within specific guidelines? Does the dress submission photo need to be the actual student in the dress? Is stock photo acceptable? Not everyone buys their Prom Dress in a store. Consignment stores, online retailers, eBay, and other resale options are great ways to save money on a Prom Dress, but may prove difficult for preapproval. How long before Approval decision? What if the outfit is submitted for review, then sold to someone else while waiting for approval? Not many stores will hold a dress for more than a day or two. How early can dresses be submitted? 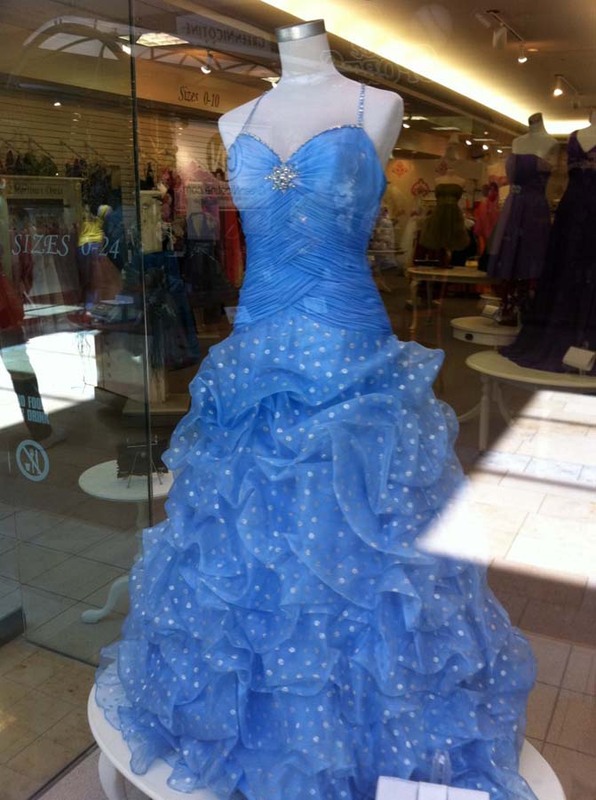 Most Prom Dress shopping occurs 2-3 months before the big event. How late can dresses be submitted? What is the absolute latest deadline for preapproval? Some girls special order their dresses, or just do not find “the one” until the week before Prom. How horrible for a student to miss out because she could not find an appropriate dress, that she could afford, in her size, that she likes, early enough for approval! Are specific reasons provided for a dress that is not approved? If straps are added, would be dress pass? What are the specific requirements for straps, are spaghetti straps acceptable or 1 inch wide? Why is a tasteful pantsuit or tuxedo style outfit inappropriate for a female at Prom? Prom Dress Codes should not be this difficult! School dress codes (another rant for another day) are in place to facilitate learning. What is being taught at the Prom? Social skills and reinforcement of a celebration, specifically how to behave and dress. Yet, sadly, the only knowledge being passed on is early body shaming of girls and that educators are too dumb or lazy to write measurable and enforceable guidelines. What is your Prom Dress Code? How do you feel about Prom Dress Preapproval?